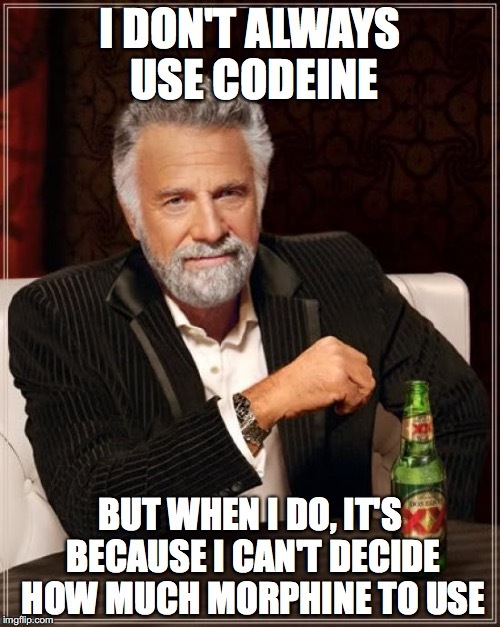 There are two major concerns that I think about when it comes to codeine drug interactions and pharmacokinetics. One is pharmacogenetic differences, and the other is the potential for drug interactions. I can’t recall a recommendation or a situation where I thought to myself, “Self, this would be a good time to recommend using codeine”. Let’s breakdown a few medications that can impact CYP2D6 and how this impacts codeine. CYP2D6 is an enzyme that metabolizes codeine to morphine. Morphine exerts opioid activity. If we inhibit (stop the activity) 2D6, what will happen is that less morphine will be formed and the analgesic/opioid activity will be reduced. Classic medications that I think of that inhibit CYP2D6 are psych medications. Bupropion, paroxetine, and fluoxetine are three classic examples that I think of. I hope you don’t have a patient on chronic codeine, but if you do, there is a chance that reduced morphine concentrations could theoretically lead to withdrawal, and/or reduced pain control. A more likely scenario is that a patient is put on short term codeine for acute pain management. In this scenario, the patient may already be on paroxetine (or other CYP2D6 inhibitor) and the patient may not respond very well to the codeine.